DC Comics presents classic adventures in a whole new way: in black and white, on heavy stock suitable for coloring! This Eisner Award-winning tale told the origin of Harley Quinn, by the creative team that first introduced her in Batman: The Animated Series! 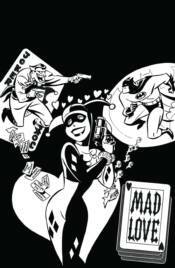 Includes MAD LOVE, plus stories from BATMAN ADVENTURES ANNUAL #1 and BATMAN ADVENTURES HOLIDAY SPECIAL #1.